3Pcs 45ml fan shape bottles combined into a whole, perfect cylinder design. Maximum save space and ease burden. Made of food grade HDPE material, BPA free and FDA approved. Sturdy but flexible. TILT IT UPSIDE DOWN to squeeze easier. Frosted translucent bottles labeled with shampoo / Skin Cream / Bath Cream for easy identification. 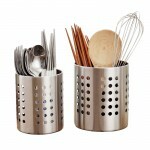 Screw-on, flip-lid cap tops against thin liquids leaking. Wide opening for easy refilling and cleaning, and small mouth for user friendly controlled flow. Safe for carry-on and airline travel in security check. Perfect for 3-10 days business trip, outdoor adventure, lodging, camping, etc. Are you still troubled that you need to carry many bottles when you travel? 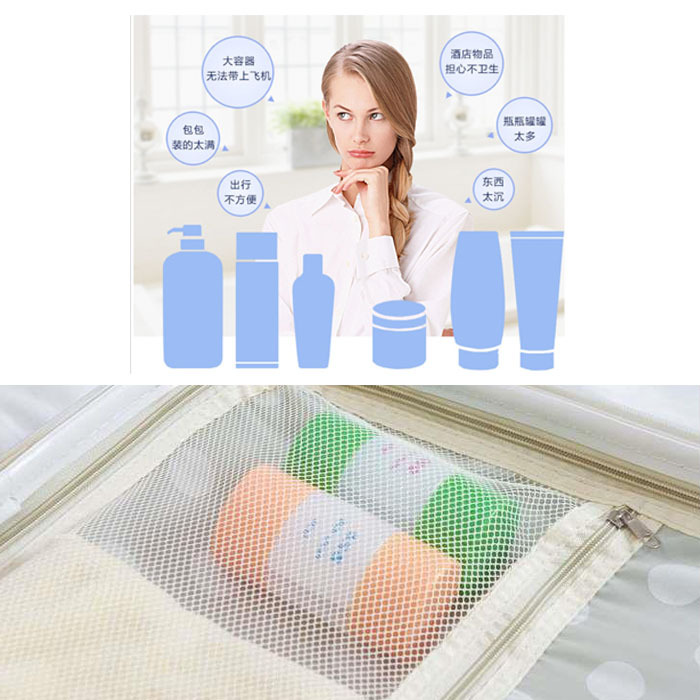 Are you still troubled that your shampoo is not allowed to bring to airline? No space in suitcase? Too heavy? Toiletries in hotels are unhygienic? 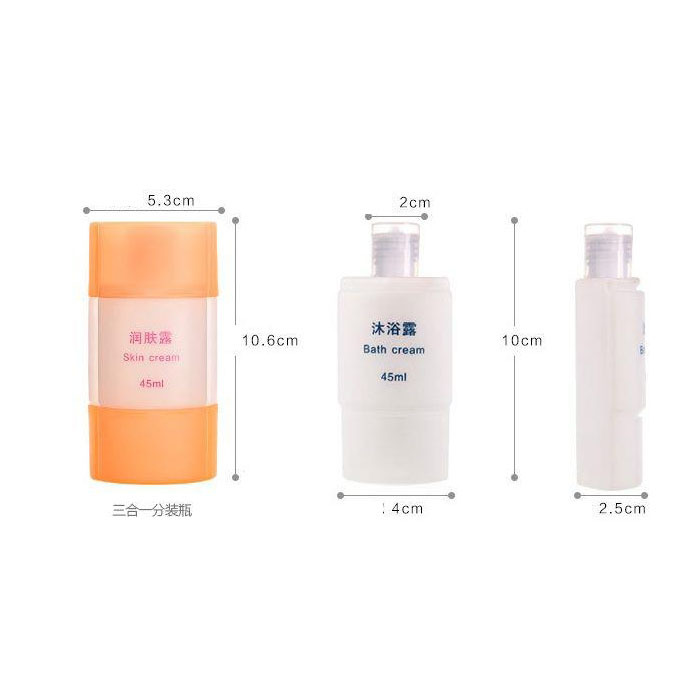 This triad packing bottles set will fix all these problems. Take it with you and go travel! 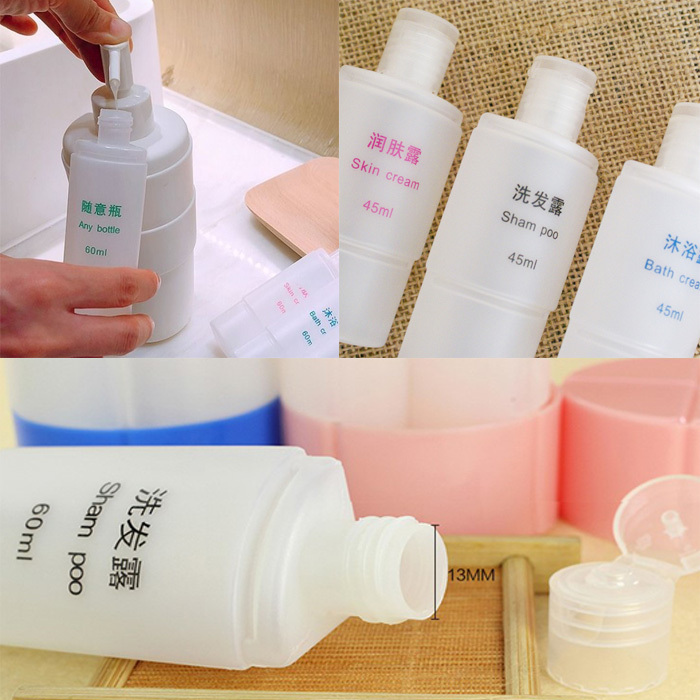 Set of small bottles, perfect for shampoo, conditioner, body wash, lotion and more. Being packed in a perfect size. 3 independent 45ml bottles. Perfect for shampoo, lotion, conditioner, sunscreen, body wash, or other toiletries. Wide opening for refilling and cleaning and small mouth for user friendly controlled flow. Screw on cap with a flip-lid cap, so thin liquids such as mouthwash will not flow out. Perfect fit the bottle bodies. Easy to take out. 120 degree bottle body design. 3 independent bottles combined into a whole, perfect size. Save more space for your suitcase.